This is the section of the book Passive Solar Energy by Bruce Anderson and Malcolm Wells that deals with solar rooms, sunspaces and greenhouses. It includes solar room ideas and design information, as well as construction drawings and some example photos of solar rooms. This material is made available through the generosity of the authors. The entire book, covering many aspects of passive solar energy can be downloaded here. Without ventilation or thermal mass, the temperatures of spaces having large areas of south-facing windows will fluctuate widely. Temperatures of conventional non-solar greenhouses, for example, can rise to over 100° on sunny winter days and then drop to below freezing at night. If a sun heated room is permitted to have wider-than-normal temperature fluctuation, then the costs of thermal mass (to store heat) and movable insulation (to reduce heat loss) are avoided. The excess warmth from such a "solar room" can heat the house immediately, or if mass is added, heat can be stored for later use after the sun sets. Almost always, the solar room is warmer than the outdoor temperature, thus reducing heat loss from the building where the room is attached. Examples of solar rooms include greenhouses, solariums, and sun porches. Greenhouses are the most common solar rooms. Conventional greenhouses, however, are not designed to take maximum advantage of the sun's energy. The problem is that most are built with a single layer of glass, and so they lose more heat at night than they gain from the sun during the day. Consequently, they need expensive auxiliary heat to keep the plants warm. A solar greenhouse is designed both to maximize solar gain and to minimize heat loss. Usually, only the south facing walls and roof of the solar greenhouses are glazed, while the east and west walls are well-insulated. (Southeast and southwest portions, if any, are also glazed, partly because plants need that low-angle early sunlight.) If at least two layers of glass or plastic are used instead of one, this type of greenhouse will remain above freezing most of the winter in all but the coldest climates of this country. However, for maximum heat savings while growing plants year round, three and even four layers of glass and plastic should be used where winters have more than 5000 degree days. Keep in mind that each additional layer of glazing blocks additional sunlight. Therefore, for the highest possible light transmission, the third and fourth layers must be a very clear film, such as Teflon™ or Tedlar™. 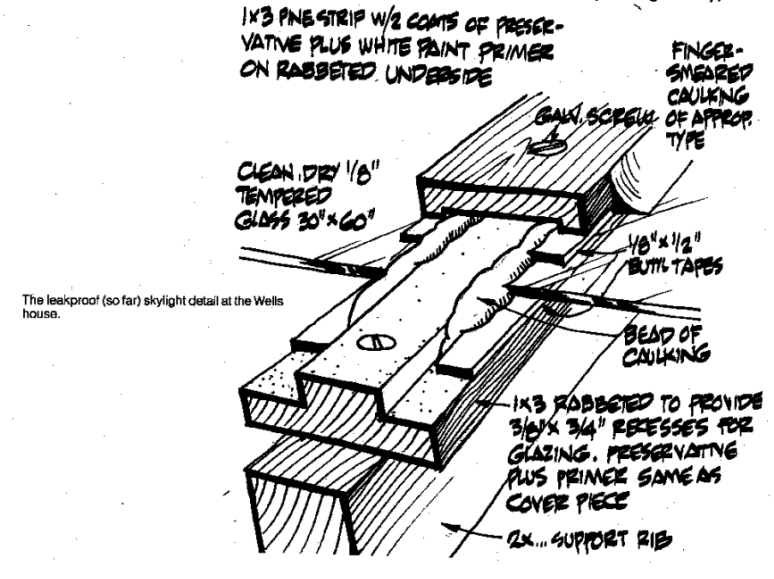 Each layer must be sealed tightly to prevent structural damage from possible moisture condensation between glazing. For maximum sunshine, and for minimum heat loss at night, movable insulation is used in combination with double glazing. This can be tough to do, however. Some of the tricky design and construction problems include storing the insulation out of the way during the day, interfering with plants while moving the insulation, and obtaining tight seals against the glazing when the insulation is closed. Additional considerations include the need for insulation to resist mold, other plant and insect life, and moisture damage. Glazing for solar rooms should be vertical or sloped no more than 30° from vertical (at least 60° from horizontal). Before you build, however, talk to everyone you can find who has ever used glass in a sloping position, and ask about leaks. If you can find someone who can convince you of a leak proof system, do not let any details escape your attention. Also, read the fine print in the sealants literature. Some silicones are attacked by mildew, many won't stick to wood, and all must be applied only to super clean surfaces. As with other passive systems, thermal mass enhances the performance of a solar room. Thermal storage mass moderates temperature swings, provides more stable growing temperatures for plants, and increases overall heating efficiency. The heat-storing capability of the planting beds can be supplemented with 55-gallon drums, plastic jugs, or other containers of water. Two to four gallons of water per square foot of glazing is probably adequate for most solar rooms. 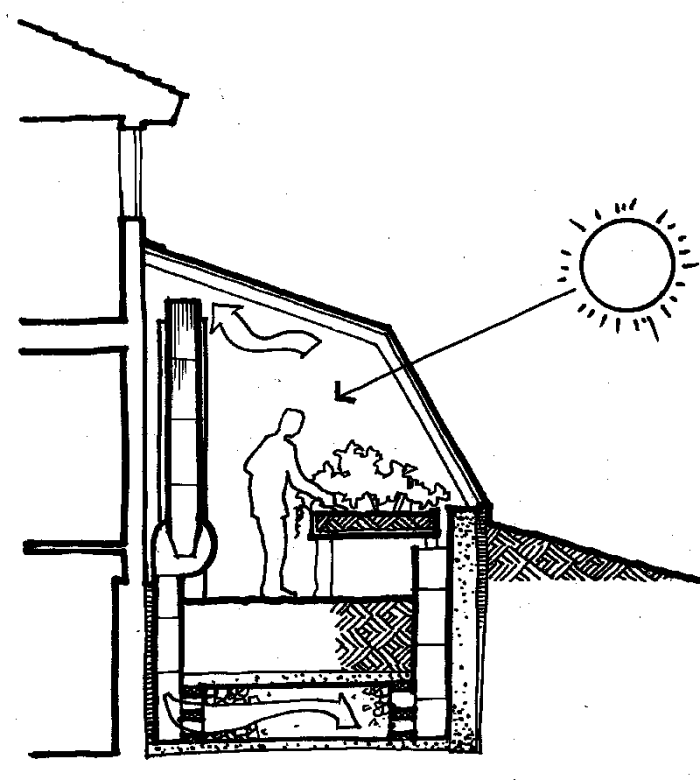 Many of the most successful solar rooms are separated from the house by a heavy wall that stores the heat. The wall, built of concrete, stone, brick, or adobe, conducts heat (slowly) into the house. At the same time, the wall keeps the solar room cooler during the day and warmer at night. 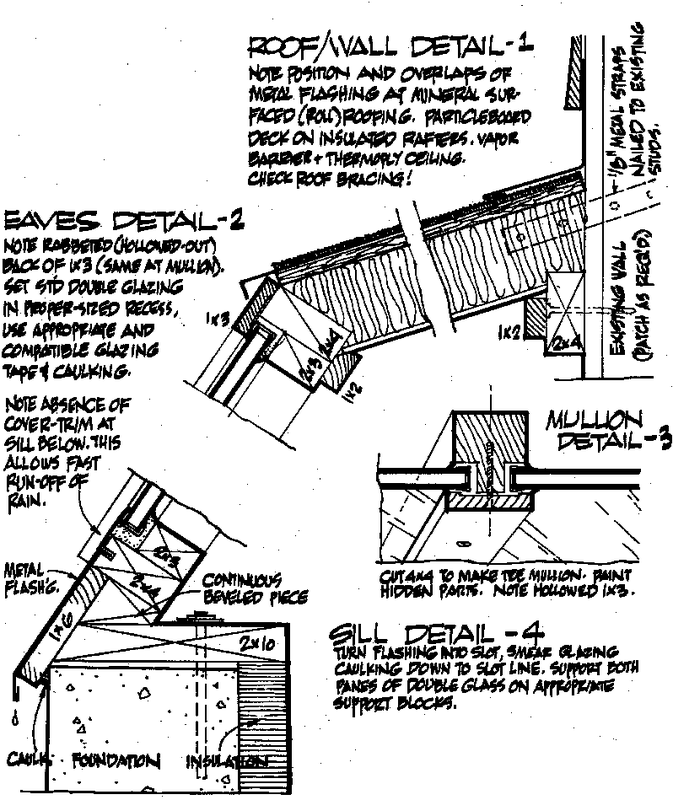 Use the design and construction information for solar walls, but eliminate the glazing. When solar rooms larger than 200 square feet reach 90°, a fan can be used to circulate the collected heat. Because plants benefit from having warm soil, hot air can be blown horizontally through a 2-foot-deep bed of stones below the greenhouse floor or under raised planting beds. Stone beds can also be built beneath the floor of the house and should not be insulated from it. Then the heat will rise naturally through the stone beds and into the planting bed soil or into the house. Solar rooms can be relatively simple to build, yet they can be very expensive if they are of the same quality and durability as the rest of your house. 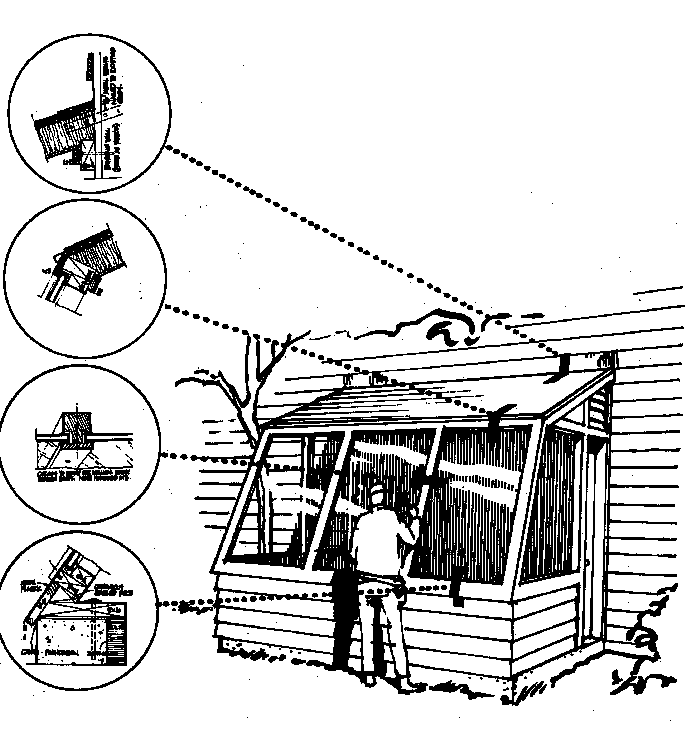 For example, with a few hundred dollars worth of materials, you can build a simple, wood-framed addition to your house to support thin-film plastics. The resulting enclosure will provide considerable heat, especially if it is not used for growing plants. On the other hand, good craftsmanship and quality materials can result in costs of several thousand dollars. In general, solar rooms are most economical when you can use them for more than providing heat and when they are built to a quality that will both enhance the value of your house and appreciate in value as your house does. Solar rooms are often exempt from local property taxes. Check with your local officials. Most of the information in this chapter is applicable for relatively small solar rooms of 100 to 200 square feet. Unless your house is super insulated or in a mild climate, a solar room of this size will provide less than 25 percent of your heat. For big leaky houses, small solar rooms will provide as little as 5 or 10 percent of the heat. Both the solar room and house will lose less heat. Heat will move easily from the solar room to your house. Natural light can be made to penetrate deep into your house. The solar room can be easily heated by the house if necessary and so is unlikely to freeze. The solar room can be readily used as an expanded living space. You can build your house compactly and the solar room will provide a feeling of large exterior wall and window area. Growing Plants; some things to remember An important function of some solar rooms is the growing of food-and flowers. Warm soil and sufficient light are critical for successful plant growth. Remember that the multiple layers of glass or plastic you may need to use will reduce light levels, a crucial issue in climates with below-average sunshine. Circulation of warm air through gravel beds under the soil can raise planting bed temperatures, increasing the growth rate of most plants. Cold weather plants, such as cabbage, can tolerate cold temperatures, sometimes even mildly-freezing ones. Few house plants can be permitted to freeze, but many can endure rather cool temperatures. On the other hand, some plants, such as orchids, require stable, high temperatures. When warm, stable temperatures are required, the solar room must retain most of its solar heat; little heat should be allowed to move into the house. Three or four layers of glass or plastic (or movable insulation) and plenty of thermal mass are required to trap and contain the heat in cold climates. Evaporation of water from planting beds and transpiration by the plants causes humidity. Each gallon of water thus vaporized used roughly 8000 Btus, nearly the same amount of energy supplied by 5 square feet of glass on a sunny day. Also, water vaporization reduces peak temperatures. It may be undesirable to circulate moisture-laden air into the house, unless the house is very dry. Greenhouse environments are rather complex ecological systems. Unexpected and sometimes undesirable plant and animal growth may proliferate. Indications are that the greater mix of plants and animals, the more likely a natural balance will eventually be reached. To obtain this balance, some owners leave the door of their solar room open to the outside during the warm and mild weather. New Alchemy Institute, among others, has pioneered work in natural pest control and companion planting as a step toward success¬ful greenhouse management. They have also investigated fish-raising in large "aquariums," which also serve as thermal mass. Human, animal, and/or plant wastes are integrated into the total ecology of many advanced greenhouses, which are sometimes referred to as bioshelters. A more thorough understanding of the many natural cycles that are possible in greenhouses will offer rewards. Here are photos of several different types of solar rooms, including sunspaces, solar porches, and greenhouses.